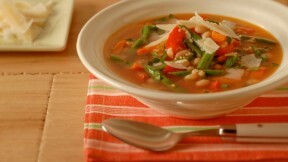 Minestrone is a thick, Italian soup with a chicken broth base with a lot of room for variety. In a 3-quart microwave-safe dish, place oil, carrots, bell pepper, green beans, and garlic; stir to coat. Cover and microwave on high for 5 minutes. Add couscous, broth, tomato paste, navy beans, 1 cup water, and 1/2 teaspoon coarse salt. Cover; microwave on high until vegetables and couscous are tender, 5 minutes. If desired, stir in parsley, and garnish with cheese. This hearty and colorful soup is perfect on a chilly night.